With patent disputes between tech companies flying hither and thither these days, lawyers working for the firms involved have certainly got their work cut out. 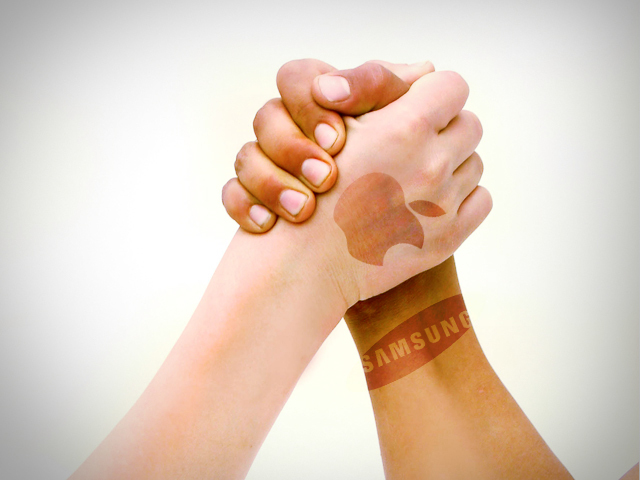 Apple and Samsung are two such industry giants currently at each other’s throats, fighting it out over around 20 patent-related cases in 10 countries. Things look like they could be about to take a different course, however, as Apple CEO Tim Cook and Samsung CEO Choi Gee-sung have agreed to sit around a table and try to come to a deal on one of these cases. Lawyers will, of course, be present. According to a Reuters report, Cook and Gee-sung have agreed to meet at a so-called settlement conference in an attempt to resolve the issue surrounding the Cupertino company’s accusation that Samsung “slavishly” copied elements of the iPhone and iPad in the design of its Galaxy line of mobile handsets and tablets. The talks will be led by a San Francisco-based magistrate judge at some point in the next 90 days. If they fail to reach a settlement, the dispute will go to trial late July. So there we have it — at some point in the next few months, the bigwigs from two of the world’s most successful mobile device companies will face each other across a table for talks which could lead to the settlement of one of the patent disputes in which they’re currently embroiled. Of course, there’s a fair chance too that it could end badly (a shouting match? name calling?) and instead turn up in court in July.